Mattie Sophia Amundson was born on 6 January 1885 at Jamesville, Yankton, South Dakota. She was the daughter of Nicholas Amundson and Sophia Olson. [S245] U.S. Federal Census 1900 U.S. Federal Census, by Ancestry.com, ED356. Dwelling 100. He was the son of Nicholas Amundson and Sophia Olson. [S9] South Dakota, South Dakota Birth Records South Dakota, File Date: December 28, 1943 (unknown file date). [S244] U.S. Federal Census 1910 U.S. Federal Census, by Ancestry.com, ED450. Dwelling 6. Name Variation Matilda Amundson was also known as Mathilda. Matilda Amundson was born in October 1890 at Jamesville, Yankton, South Dakota. Sarah Amundson was born in December 1892 at Jamesville, Yankton, South Dakota. Joseph Herman Weitzel was born in April 1877 at Wisconsin. He was the son of Peter Weitzel and Mary Zeckman. Joseph Herman Weitzel married Carrie Constantine, daughter of Peter Constantine and Elvira Kennedy, on 31 October 1900 at Sauk, Wisconsin. Joseph Herman Weitzel died in June 1937 at age 60. [S246] U.S. Federal Census 1880 U.S. Federal Census, by Ancestry.com, NA Film Number T9-1445 Page Number 101C. [S245] U.S. Federal Census 1900 U.S. Federal Census, by Ancestry.com, ED129. Dwelling 110. [S244] U.S. Federal Census 1910 U.S. Federal Census, by Ancestry.com, ED129. Dwelling 156. [S243] U.S. Federal Census 1920 U.S. Federal Census, by Ancestry.com, ED212. Dwelling 151. Ancestry indexed as Baraboo. [S250] U.S. Federal Census 1930 U.S. Federal Census, by Ancestry.com, ED56-8. Dwelling 87. Married Name 31 October 1900 As of 31 October 1900,her married name was Weitzel. Carrie Constantine was born in 1883 at Wisconsin. She was the daughter of Peter Constantine and Elvira Kennedy. Carrie Constantine married Joseph Herman Weitzel, son of Peter Weitzel and Mary Zeckman, on 31 October 1900 at Sauk, Wisconsin. Carrie Constantine died on 23 February 1922. Carrie Constantine had 2 with 2 living in 1910 children. Married Name 5 January 1949 As of 5 January 1949,her married name was Walsh. Jeannine M. Stoddard was born on 18 June 1929 at Wisconsin. She was the daughter of Raymond Harold Stoddard and Madge Mary Weitzel. Jeannine M. Stoddard married William Walsh, son of William L. Walsh, on 5 January 1949. Jeannine M. Stoddard died on 14 March 2001 at Madison, Dane, Wisconsin, at age 71 Jeannine (Stoddard) Walsh obituary. Jeannine M. Stoddard obtained US Social Security Card at Wisconsin; last residence Plain, Sauk, Wisconsin. Married Name 5 September 1938 As of 5 September 1938,her married name was Weidner. Genevieve A. Bindl was born on 19 October 1916 at Wisconsin. She was the daughter of John O. Bindl and Margaret Frances Lehner. Genevieve A. Bindl married Albert Herman Weidner, son of John J. Weidner and Lillian C. Meixelsperger, on 5 September 1938 at St. John's, Spring Green, Sauk, Wisconsin. Genevieve A. Bindl died on 31 July 2011 at age 94 Genevieve A. Weidner, age 94, of Plain, passed away on Sunday, July 31, 2011, with family by her side at the Greenway Manor Nursing Home following a brief illness. 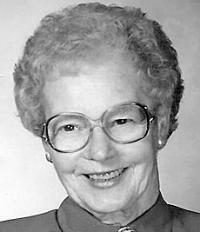 She was born on Oct. 19, 1916, in Spring Green, the daughter of John and Margaret (Lehner) Bindl. She was married on Sept. 5, 1938, to Albert H. Weidner at St. John's Catholic Church in Spring Green. Survivors include four daughters, Dorothy Ann (Merle) Alt of Baraboo, Mary Jane (Michael) Royack of Richland, Wash., Betty Jean (James) Harris of Minooka, Ill., and Carol (Gerald "Jerry") Bindl of Spring Green; 10 grandchildren, Therese (Olaf) Wick of New Richmond, Ann Lopez of Raleigh, N.C., Michele (Chava) Leon of Montgomery, Ill., Mary Jo Alt and Michael Alt of Baraboo, Gregory (Katrin) Royack of Port Angeles, Wash., Lisa (Kyle Crabtree) Royack of Fife, Wash., Michael (Angie) Harris of Minooka, Ill., Brian (Renee) Bindl of Arlington, and Michael (Michele) Bindl of Spring Green; 12 great-grandchildren; a great-great-grandson; a brother, Lawrence (Annette) Bindl of Wausau; two sisters-in-law, Anita Bindl of Spring Green, and Shirley Bindl of Lone Rock; and many nieces, nephews, other relatives and friends. Genevieve was preceded in death by her husband, Albert on April 30, 2002; her parents, John and Margaret Bindl; five brothers, Francis, John, Leo, Bernard and Sylvester; a sister, Mary Dischler; five sisters-in-law, Betty Wiseman Bindl, Betty Austin Bindl, Mary Ann Bindl, Mathilda Bindl and Betty Ray Bindl; and a brother-in-law, Pat Dischler. A Mass of Christian Burial will be held on Saturday, Aug. 6, 2011, at 11:30 a.m. at ST. LUKE'S CATHOLIC CHURCH in Plain. Father Mike Resop will officiate with burial in the church cemetery. Visitation will be held on Saturday at the church from 9:30 a.m. until the time of Mass. Online condolences available at www.staffordfuneralhomes.com. The Richardson-Stafford Funeral Home is assisting the family with the arrangements. Francis Joseph Bindl was born on 29 October 1918 at Wisconsin. He was the son of John O. Bindl and Margaret Frances Lehner. Francis Joseph Bindl married Mathilda C. Reisinger, daughter of Alois Reisinger and Theresa Roth, on 3 September 1940 at St. John's Catholic Church, Spring Green, Sauk, Wisconsin. Francis Joseph Bindl died on 8 January 1969 at age 50. Married Name 27 November 1941 As of 27 November 1941,her married name was Dischler. Mary Josephine Bindl was born on 19 March 1920 at Wisconsin. Mary Josephine Bindl married Anthony H. Dischler, son of John Baptist Dischler and Mary K. Brickl, on 27 November 1941. Mary Josephine Bindl died on 9 February 2011 at age 90 Mary J. Dischler, age 90, of Plain, passed away on Wednesday, Feb. 9, 2011, at the Maplewood Nursing Home in Prairie du Sac. She was born on March 19, 1920, the daughter of John and Margaret (Lehner) Bindl. She was married on Nov. 27, 1941, to Anthony H. "Pat" Dischler. Mary and Pat started their life together farming in the rural Highland and Avoca area and later moved to Plain where they retired. Mary was a member of St. Luke's Catholic Church, American Legion Auxiliary Post No. 398, National Active and Retired Federal Employees Association and retired as postmaster in Plain in 1980 after 27 years of service. Survivors include three children, John (Charlotte) Dischler of Plain, Joanne Dischler of Waunakee, and Pat (Sheila) Dischler of Oregon; six grandchildren, Stephanie Dischler of Prairie du Sac, Steve (Patricia) Dischler of Sauk City, Ryan (Tanya) Quint of Waunakee, Nicole (Jeff) Maly of Waunakee, Erin Dischler (Steve Hackbarth) of Watertown, and Kristina (Steve) Stauffacher of Fort Atkinson; eight great-grandchildren; two siblings, Genevieve Weidner of Plain, and Larry (Annette) Bindl of Wausau; five sisters-in-law, Sister Juliana O.P. of Racine, Marlene Dischler of Loganville, Carrie Dischler of Plain, Anita Bindl of Spring Green, and Shirley Bindl of Lone Rock; and many nieces, nephews, other relatives and friends. She was preceded in death by her parents, John and Margaret Bindl; her husband, Anthony H. "Pat" Dischler; five brothers, Francis, Bernard, John B., Leo and Sylvester Bindl; eight brothers-in-law, Albert Weidner, Art Servais, Gerhardt Dischler, Mike Dischler, Paul Dischler, John F. Dischler, Joseph Weiss and Wilbert Mueller; and eight sisters-in-law, Ann Servais, Rose Dischler, Lorraine Dischler, Alma Mueller, Betty Bindl of Maryland, Betty Bindl of Beloit, Betty Bindl of Montana, and Mathilda Bindl. A Mass of Christian Burial will be held on Saturday, Feb. 12, 2011, at 11 a.m. at ST. LUKE'S CATHOLIC CHURCH in Plain. Father Raymond Dischler will officiate with burial in the church cemetery in the spring. Visitation will be held on Saturday at the church from 9 a.m. until the Mass at 11 a.m. Memorials may be made to St. Ann's Hill or the St. Luke's School Endowment. The Richardson-Stafford Funeral Home is assisting the family with the arrangements. Online condolences available at www.staffordfuneralhomes.com. 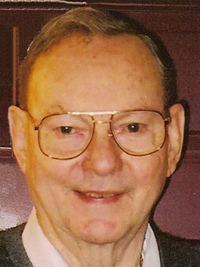 John Bartel Bindl was born on 3 November 1921 at Wisconsin. John Bartel Bindl married Elizabeth Jane Weisman on 4 February 1953. John Bartel Bindl married Betty Jean Knowles, daughter of William Hay Knowles and Leona B. Doyle, on 5 September 1981. John Bartel Bindl died on 9 June 2007 at age 85 John Bartel Bindl died peacefully June 9, 2007, surrounded by family members in Los Altos, Calif. Born Nov. 3, 1921, in Spring Green, Wis., to John Bindl and Margaret F. (Lehner) Bindl, John spent his first 13 years on the family farm. He entered the seminary in St. Nazian, Wis., in 1935, where, in addition to his academic load, he participated in track, basketball and gymnastics, played the saxophone and clarinet, was a drum major and director of the band. He was transferred to Lanham, Md., in 1941, for four years of seminary training. He left the seminary in 1945 and was drafted into the Army. Because of his musical background, he was put in charge of reforming bands that had been disrupted by the war. He would bring in remaining members from various bands and form one band. These service bands supplied music for marching and parades. After his discharge, John returned to the Washington, D. C., area and through the Veteran Employment office, found work as a probation officer in Washington, D. C., with the U. S. District Court, a job he held for more than 20 years. While working in the probation office, he met and married Elizabeth Jane (Weisman) Bindl. They had four children and were married for more than 25 years. John became the head of the probation system for Washington D. C., then retired and moved to Noxon in 1976. While in Noxon, he drove the school bus for the Noxon School District. After the death of his first wife, he met and married Betty Jean (Knowles Austin) Bindl. John and Betty ran the Lakeside Motel in Trout Creek and were founding members in the annual Trout Creek Huckleberry Festival. John was a member of the St. William Catholic Church in Thompson Falls. John and Betty retired and moved to Townsend in 1990. John attended St. Mary's Catholic Church in Helena and ran a men's support group at the local nursing home. John was diagnosed with Alzheimer's disease in 1998. John and Betty lived in Helena for a couple of years before moving to Bozeman. He moved to the Los Altos, Calif., area in 2004, so that his daughter, Jane, could more carefully monitor his health issues and care for him. John's survivors include his sisters, Genevieve (Bindl) Weidner and Mary (Bindl) Dischler; brother, Laurence Bindl of Wisconsin; his children, Jane Bindl Oi of California; John G. Bindl of Idaho; William J. Bindl of Maryland; Martin J. Bindl of Washington; Kerry (Austin) Pettit of Montana; Russ Austin of Idaho and Mark Austin of Arizona; seven grandchildren by his first marriage and five grandchildren by his second marriage. Memorial services will be held held Monday, June 18, 2007, at St. William Catholic Church in Thompson Falls followed by a graveside service at the Noxon Cemetery in Noxon. John Bartel Bindl obtained US Social Security Card; issued by Long-time or retired railroad workers; last residence Los Altos, Santa Clara, California. Name Variation Leo Joseph Bindl was also known as Leo A.
Leo Joseph Bindl was born on 16 October 1924 at Spring Green, Sauk, Wisconsin. Leo Joseph Bindl died on 30 October 2003 at age 79 Leo Bindl, age 79, of Spring Green, passed away peacefully on Thursday, Oct. 30, 2003, at his residence following a long illness. He was born on Oct. 16, 1924, in Spring Green township, the son of John and Margaret (Lehner) Bindl. He was married on March 28, 1951, to the former Anita Bayer. Leo was a member of St. John's Catholic Church, the Knights of Columbus, past grand knight and treasurer of Spring Green township for 14 years. Survivors include his wife of 52 years, Anita Bindl of Spring Green; nine children, Tim (Alice), Terry (Cindy), Tom (Jean), Ted (Teresa) and Mark (Angela Miller) Bindl, all of Spring Green, Carol (Jim) Yttri of Cross Plains, Karen (Brady) Shelton of Spring Green, Dave (Kiki) Bindl of Verona, and Dean (Beanie) Bindl of Spring Green; 20 grandchildren; a great-granddaughter; two sisters, Genevieve Weidner of Plain, and Mary (Pat) Dischler of Plain; three brothers, John (Betty) Bindl of Bozeman, Mont., Sylvester (Shirley) Bindl of Lone Rock, and Larry (Annette) Bindl of Wausau; two sisters-in-law, Betty Bindl of Beloit, and Matilda Bindl of Spring Green; many nieces, nephews, other relatives and friends. He was preceded in death by his parents, John and Margaret Bindl; two brothers, Francis and Bernard Bindl; and a brother-in-law, Albert Weidner. A Mass of Christian Burial will be held on Tuesday, Nov. 4, 2003, at 11 a.m. at ST. JOHN'S CATHOLIC CHURCH, Spring Green. Father Mike Resop will officiate with burial in the church cemetery at a later date. Visitation will be held on Monday, Nov. 3, 2003, at ST. JOHN'S CATHOLIC CHURCH from 4 p.m. until 8 p.m. where a Knights of Columbus rosary will be recited at 7:30 p.m. Visitation will also be held on Tuesday from 10 a.m. until the time of the service. Richardson-Stafford Funeral Home, Spring Green, is assisting the family with the arrangements. Memorials may be made to St. Johns Endowment Fund. Leo Joseph Bindl obtained US Social Security Card at Wisconsin; last residence Spring Green, Sauk, Wisconsin. Bernard Alois Bindl was born on 1 June 1926 at Wisconsin. Bernard Alois Bindl married Betty Ray, daughter of Roland Ray and Florence Amy (? ), on 27 August 1947. Bernard Alois Bindl died on 25 October 1995 at age 69. Bernard Alois Bindl obtained US Social Security Card at Wisconsin; last residence Beloit, Rock, Wisconsin. Name Variation Sylvester Joseph Bindl was also known as Syl. Sylvester Joseph Bindl was born on 3 December 1929 at Wisconsin. Sylvester Joseph Bindl married Shirley Alice Fry, daughter of Frank Fry and Victoria Robinson, on 10 March 1951. Sylvester Joseph Bindl died on 28 May 2005 at Richland, Wisconsin, at age 75 Sylvester ‘Syl’ Bindl, 75, of Lone Rock died Saturday, May 28, 2005 at the Richland Hospital. On December 3, 1929 he was born the son of John and Margaret (Lehner) Bindl. Syl served in the Army between 1946 and 1951 serving as a Staff Sergeant during WWII and the Korean Conflict. On March 10, 1951 Sylvester married Shirley Fry in Spring Green. Syl worked for the Village of Lone Rock for 40 years, and served as the Police Chief for 26. He also was a member of the Lone Rock Fire Department for 53 years and served as Chief for 38 years. Syl is survived by his wife Shirley of Lone Rock, six children Bob (Brenda) Bindl of Richland Center, Jim Bindl of Richland Center, Luane (Don) DeMartini of Illinois, Bill (Amy) Bindl of Richland Center, Rich (Linda) Bindl of Spring Green, Randy Bindl of Richland Center, 10 grandchildren, 3 step grandchildren, 6 step great-grandchildren, 1 step great-great-granddaughter, 2 sisters Genevieve Weidner of Plain, Mary Dischler of Plain, two brothers, John (Betty) Bindl of Montana, Larry (Annette) Bindl of Wausau, three sister-in-laws, Tillie Bindl of Spring Green, Betty Bindl of Beloit, Anita Bindl of Spring Green, many nieces, nephews, other relatives and friends. Syl was preceded in death by his parents, three brothers, Francis, Bernard, and Leo. 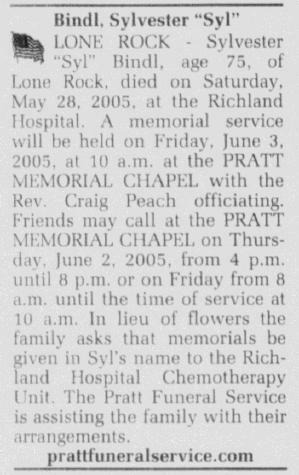 A memorial service will be held on Friday, June 3, 2005 at 10:00 AM at the PRATT MEMORIAL CHAPEL with Reverend Craig Peach officiating. 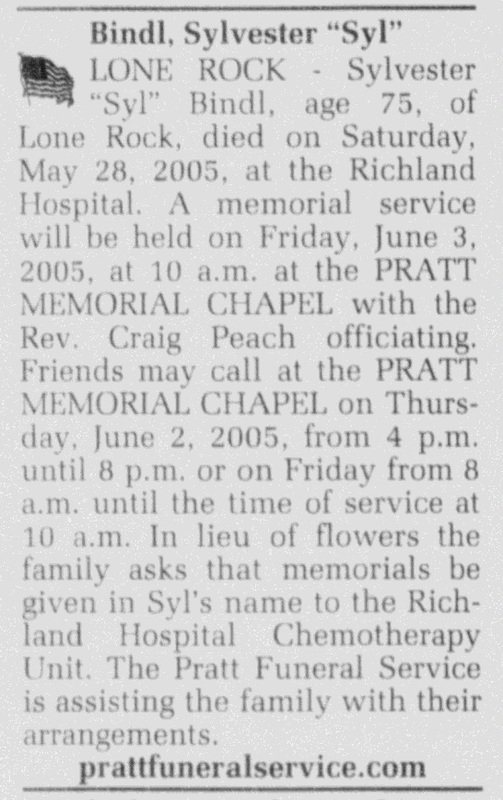 Friends may call at the Pratt Memorial Chapel on Thursday, June 2, 2005 from 4:00 PM until 8:00 PM or on Friday from 8:00AM until the time of service at 10:00 AM. The Pratt Funeral Service is assisting the family with their arrangements. Sylvester Joseph Bindl obtained US Social Security Card at Wisconsin; last residence Lone Rock, Richland, Wisconsin. Catherine (?) married (?) Ruhland. Catherine (?) was born circa 1807 at Bavaria, Germany. (?) Ruhland was born at Bavaria, Germany. (?) Ruhland died before 1880. Married Name Her married name was Haller. Barbara Dischler married Joseph Haller. Barbara Dischler was born on 15 November 1874 at Wisconsin. 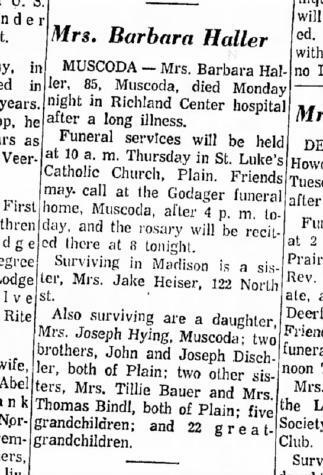 Barbara Dischler died on 25 July 1960 at Richland Center, Richland, Wisconsin, at age 85 Barbara Dischler Haller obituary. Name Variation Mathilda Dischler was also known as Tillie. Married Name 14 November 1900 As of 14 November 1900,her married name was Bauer. Mathilda Dischler was born in April 1877 at Plain, Sauk, Wisconsin. Mathilda Dischler married John W. Bauer, son of Wolfgang Bauer and Anna Strick, on 14 November 1900 at Plain, Sauk, Wisconsin. Mathilda Dischler died after July 1960. Mathilda Dischler had 2 with 2 living in 1910 children. [S244] U.S. Federal Census 1910 U.S. Federal Census, by Ancestry.com, ED115. Dwelling 177. [S243] U.S. Federal Census 1920 U.S. Federal Census, by Ancestry.com, ED164. Dwelling 212. Name Variation Kirsten Nielsdatter Bjorneraas was also known as Kristine. Married Name 19 July 1835 As of 19 July 1835,her married name was Brevig. Kirsten Nielsdatter Bjorneraas was born on 15 November 1811 at Bjorneraas, Rissa, Stadsbygd, Sor Tronderlag, Norway. She was the daughter of Nils Pederson Bjorneraas and Barit Olsdatter Lykken. Kirsten Nielsdatter Bjorneraas married Amund Olsen Brevig, son of Ole Amundson Brevig and Olava Johnsdatter Bjorgan, on 19 July 1835 at Leksvik parish, Norway. Kirsten Nielsdatter Bjorneraas died on 12 December 1899 at Van Viken, Norway, at age 88. Name Variation Anton Amundson was also known as Anton Amundson Brevik. Name Variation Anton Amundson was also known as Anson. Anton Amundson was born on 19 July 1845 at Leksvik, Norway. He was the son of Amund Olsen Brevig and Kirsten Nielsdatter Bjorneraas. Anton Amundson married Oline Jakobsdatter Foss, daughter of Jakob Olsen Foss and Anne Bersvendsdatter Foss, on 30 June 1874 at St. Paul's Lutheran Church, Brule Creek, Union, South Dakota. Anton Amundson died on 7 November 1918 at Akron, Plymouth, Iowa, at age 73. Anton Amundson immigrated on 31 May 1871 on the ship Franklin, his destination Sioux City, Iowa. That ship went to Hull, England where he took another ship arriving in Quebec 2 July 1871. [S246] U.S. Federal Census 1880 U.S. Federal Census, by Ancestry.com, NA Film Number T9-0114 Page Number 399D. [S245] U.S. Federal Census 1900 U.S. Federal Census, by Ancestry.com, Year: 1900; Census Place: Brule, Union, South Dakota; Roll T623_1555; Page: 4B; Enumeration District: 335. [S244] U.S. Federal Census 1910 U.S. Federal Census, by Ancestry.com, Year: 1910; Census Place: Richland, Union, South Dakota; Roll: T624_1489; Page: 11B; Enumeration District: 0425; FHL microfilm: 1375502. Name Variation Ole Amundson was also known as Brevik. Ole Amundson was born on 27 March 1835 born before Amund and Kirsten were married. Ole Amundson married Malena Johnsdatter Hestvold, daughter of John Johnsen Hestvold and Kristine Johnsdatter (? ), on 28 August 1870 at Stranden parish, Norway. Ole Amundson died circa 1895 at Presho, Lyman, South Dakota. 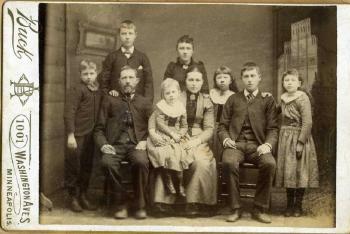 Circa 1890 Ole and Malena Amundson family photo. 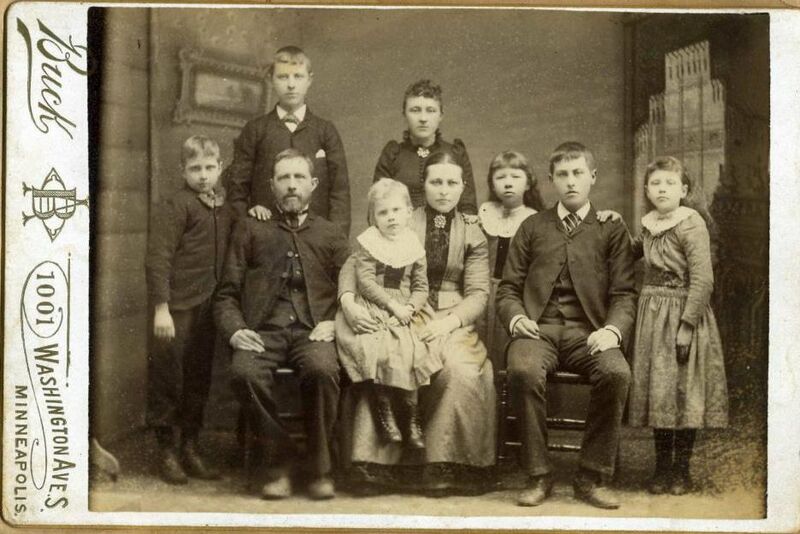 Ole Amundson and Malena Johnsdatter Hestvold immigrated in May 1890 they sailed from Trondheim on the ship “Hero” bound for Hull, England and from England on the ship "Gallia" arriving in New York on 13 June 1890, destination Minneapolis, MN. Name Variation George Mader Slowey was also known as Meter. Name Variation George Mader Slowey was also known as George Mader. George Mader Slowey was born on 19 October 1876 at Yankton, Dakota Territory. George Mader Slowey married Anna E. Medeck, daughter of Anton Medeck and Mary Wallenta, on 20 January 1915 at Yankton, South Dakota. George Mader Slowey died on 17 August 1935 at from heart trouble, Yankton, South Dakota, at age 58. He was buried after 17 August 1935 at Sacred Heart Catholic - Yankton Cemetery, Yankton, Yankton, South Dakota. 1905 South Dakota George Mader Slowey appeared on the census of 1905 at South Dakota single. George Mader Slowey was adopted after May 1877; Adopted after mother died. 1880 census has widower Henry Mader living with his sister with no children in the household. 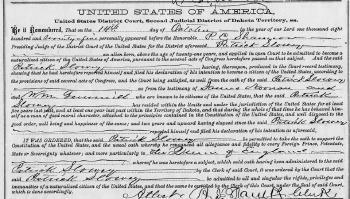 [S246] U.S. Federal Census 1880 U.S. Federal Census, by Ancestry.com, NA Film Number T9-0115 Page Number 506B. [S244] U.S. Federal Census 1910 U.S. Federal Census, by Ancestry.com, ED450. Dwelling 59. [S243] U.S. Federal Census 1920 U.S. Federal Census, by Ancestry.com, Year: 1920;Census Place: Mayfield, Yankton, South Dakota; Roll T625_1726; Page: 3B; Enumeration District: 258; Image: 770. [S250] U.S. Federal Census 1930 U.S. Federal Census, by Ancestry.com, Year: 1930; Census Place: Yankton, Yankton, South Dakota; Roll 2232; Page: 4A; Enumeration District: 21; Image: 917.0. Patrick Edward Slowey Sr. was born in August 1816 at Ireland also reported as 1814. He married Catharine McCabe circa 1849. 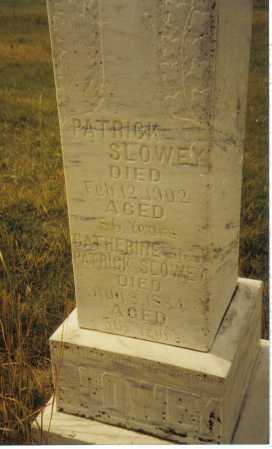 Patrick Edward Slowey Sr. died on 12 February 1902 at age 85. He was buried on 14 February 1902 at Walshtown Cemetery, Yankton, South Dakota. Patrick Slowey came to the New World and took up his residence in Wisconsin, where he carried on operations as a farmer for several years with good success. In 1872 he brought his family to South Dakota and took up three hundred and twenty acres of government land in Yankton county. He made the journey overland by teams. His first home in this state was a log house with a dirt roof, and he used oxen as well as horses in breaking his land. He continued to make his home there on until his death, which occurred in Febuary, 1902. His wife died in August 1884. Both were devout members of the Catholic church and he was a Democrat in his pollical affiliations. They had nine children - Bernard is the oldest. 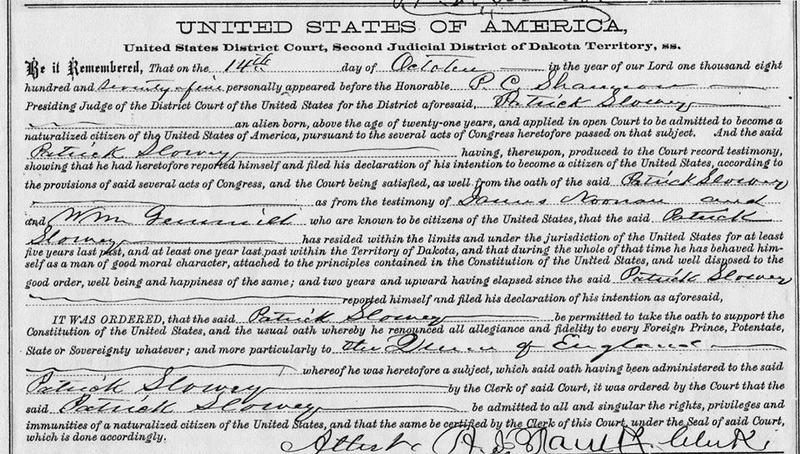 Patrick Edward Slowey Sr. was naturalized on 14 October 1875 at Yankton, Dakota Territory, United States District Court, Second Judicial District of Dakota Territory, ss. IT WAS ORDERED, that the said Patrick Slowey be permitted to take the oath to support the Constitution of the United States, and the usual oath whereby he renounced all allegiance and fidelity to every foreign Prince, Potentate, State or Sovereignty whatever; and more particularly to the Queen of England whereof he was heretofore a subject, which said oath having been administered to the said Patrick Slowey by the Clerk of said Court, it was ordered by the Court that the said Patrick Slowey be admitted to all and the singular rights, privileges and immunities of a naturalized citizen of the United States, and that the same be certified by the Clerk of this Court under the Seal of said Court, which is done accordingly. He witnessed the adoption of George Mader Slowey after May 1877; Adopted after mother died. 1880 census has widower Henry Mader living with his sister with no children in the household. [S248] U.S. Federal Census 1860 U.S. Federal Census, by Ancestry.com, Year: 1860; Census Place: Kendall, Lafayette, Wisconsin; Roll M653_1416; Page: 766; Image: 264; Family History Library Film: 805416. [S247] U.S. Federal Census 1870 U.S. Federal Census, by Ancestry.com, Year: 1870; Census Place: Kendall, Lafayette, Wisconsin; Roll M593_1722; Page: 431A; Image: 338; Family History Library Film: 553221. [S245] U.S. Federal Census 1900 U.S. Federal Census, by Ancestry.com, ED356. Dwelling 44. Name Variation Catharine McCabe was also known as Katherine. Married Name circa 1849 As of circa 1849,her married name was Slowey. Catharine McCabe was born circa 1828 at Ireland. She married Patrick Edward Slowey Sr. circa 1849. Catharine McCabe died on 8 August 1884. She was buried on 10 August 1884 at Walshtown Cemetery, Yankton, South Dakota. Catharine McCabe witnessed the adoption of George Mader Slowey after May 1877; Adopted after mother died. 1880 census has widower Henry Mader living with his sister with no children in the household. Children of Catharine McCabe and Patrick Edward Slowey Sr.
Mary Slowey married Michael Cunningham. Mary Slowey was born in 1858 at Wisconsin. She was the daughter of Patrick Edward Slowey Sr. and Catharine McCabe. Mary Slowey died in 1912. Name Variation Thomas Slowey was also known as Tom. Thomas Slowey was born in June 1858 at Wisconsin also reported as Jun 1857. He was the son of Patrick Edward Slowey Sr. and Catharine McCabe. As of 1910, Thomas Slowey was never married. [S244] U.S. Federal Census 1910 U.S. Federal Census, by Ancestry.com, ED450. Dwelling 61. John Charles Slowey was born in February 1860 at Wisconsin also reported as Feb 1861. John Charles Slowey married Tracie Burns on 24 February 1886. John Charles Slowey died on 26 April 1928 at Yankton, South Dakota, at age 68. [S245] U.S. Federal Census 1900 U.S. Federal Census, by Ancestry.com, Year: 1900; Census Place: Township 96, Yankton, South Dakota; Roll T623_1555; Page: 5A; Enumeration District: 356. Name Variation Elizabeth Slowey was also known as Lizzie. Married Name circa 1897 As of circa 1897,her married name was Murray. Elizabeth Slowey was born circa 1864 at Wisconsin. Elizabeth Slowey married James Murray, son of Christopher Murray and Catherine Doyle, circa 1897. Elizabeth Slowey died on 25 June 1937 at South Dakota. Patrick Edward Slowey Jr. was born on 16 January 1865 at Wisconsin also reported as Jan 1866. Patrick Edward Slowey Jr. married Ellen A. Murray, daughter of Christopher Murray and Catherine Doyle, on 26 November 1891. Patrick Edward Slowey Jr. died on 21 June 1942 at Mayfield, Yankton, South Dakota, at age 77. [S245] U.S. Federal Census 1900 U.S. Federal Census, by Ancestry.com, Year: 1900; Census Place: Township 96, Yankton, South Dakota; Roll: T623_1555; Page: 4A; Enumeration District: 356. [S244] U.S. Federal Census 1910 U.S. Federal Census, by Ancestry.com, Year: 1910; Census Place: Star, Clay, South Dakota; Roll: T624_1478; Page: 5B; Enumeration District: 0112; Image: 874; FHL Number: 1375491. [S21] Doane Robinson, History of South Dakota Volume 1, pages 1333. Married Name circa 1887 As of circa 1887,her married name was Murray. Ellen Slowey was born in April 1866 at Wisconsin. Ellen Slowey married Mathew Murray, son of Christopher Murray and Catherine Doyle, circa 1887. Ellen Slowey died after 1920. Ellen Slowey had zero children. [S243] U.S. Federal Census 1920 U.S. Federal Census, by Ancestry.com, Year: 1920;Census Place: Yankton Ward 2, Yankton, South Dakota; Roll: T625_1726; Page: 10B; Enumeration District: 266; Image: 947.